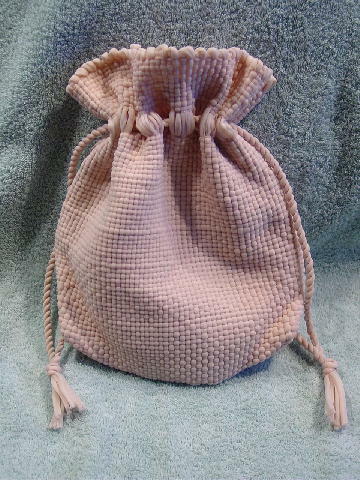 This subdued pink vintage purse has a drawstring top. It is made from synthetic fibers and has a tassel at the end of each drawstring. It's nice and roomy, and it stays closed when you pull it. It's from a Czech model who picked it up at a Paris flea market (she picked up a blue, gray, and white one there as well).